Today brought us the first teaser poster for the final chapter of Christopher Nolan’s phenomenal Batman reimagining, The Dark Knight Rises. And it’s signature Nolan. 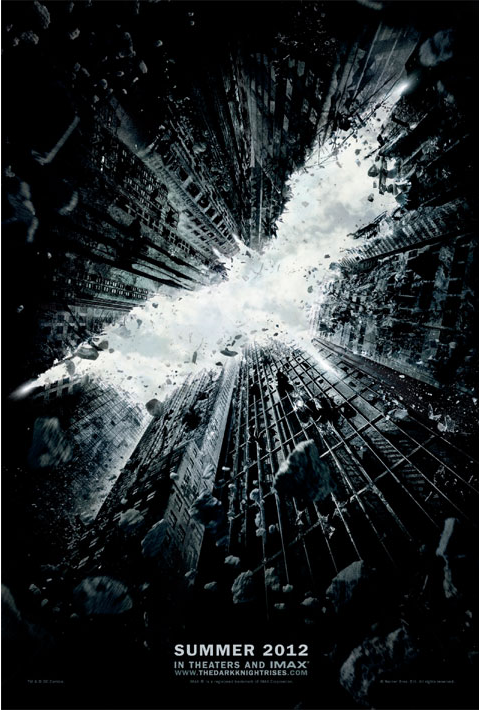 Very similar to the style of The Dark Knight and Inception marketing campaigns, I wouldn’t have it any other way. From how we look up to the sky to how the bat symbol is incorporated into the crumbling skyscrapers, it’s more than evident the dark tones of The Dark Knight will be carried over here. I think it’s also safe to say the demise of Gotham as portrayed in this poster will have a lot to do with Tom Hardy’s Bane. Tagged aaron eckhart, anne hathaway, bane, batman, batman begins, bruce wayne, catwoman, christian bale, christopher nolan, cillian murphy, debates, gary oldman, harry potter, harvey dent, heath ledger, katie holmes, maggie gyllenhaal, michael caine, morgan freeman, rachel dawes, the dark knight, the dark knight rises, the joker, tom hardy, tom wilkinson, viral marketing, warner bros.
Here’s Episode Six of my weekly movie updates. This week includes Star Trek 2, Django Unchained, Tron 3, Simon Pegg and Sam Mendes’ Bond 23.